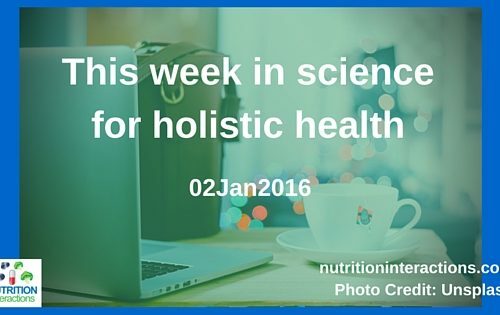 Welcome to This Week in Science for Holistic Health! I scour the science news for interesting and relevant research for a holistic approach to health. Food and Eating – Oats can help with type 2 diabetes. Disease Prevention – Urinary triclosan has been shown to be associated with risk of spontaneous abortions. Environment and Other Exposures – Yes, a good diet can reduce the effects of exposure to air pollution. Pork as a Source of Omega-3 (n-3) Fatty Acids. Did you want a copy of the food-supplement-alcohol interactions with the top 100 prescribed drugs? You’ll want to sign up here to download a free copy when I finish it…before I start selling it! Did I miss any amazing and relevant science-based holistic health news? Share in the comments below. Have you picked up your copy of NutritionFacts.org “How Not to Die”? It made the New York Time’s Bestseller List! VOTE! What topics are most important for you to see weekly updates on? This is a very interesting summary on “leaky gut”, the emerging understanding of the role of intestinal microbiota and nutrients. The cross talk among bacteria, immune, and dietary factors is able to modulate the mucosal barrier function, as well as the intestinal permeability. Several nutritional products have recently been proposed as regulators of the epithelial barrier, even if their effects are in part contradictory. Although the majority of dietary proteins are totally degraded by digestive enzymes and are absorbed in the form of nutrients, some can resist both the low pH of the gastric fluid and proteolytic enzyme hydrolysis. This means that large immunogenic peptides or intact proteins are capable of reaching the intestinal lumen by the different pathways described before. Intestinal barrier function is regulated by multiple components. Among these, an emerging role is depicted for nutrition. The role of different dietary antigens in the regulation of intestinal permeability is in part contradictory. Composition of dietary intake can have significant impact on the microbiota, and consequently on the epithelial barrier. Considering bacteria fermentation, diets enriched in milk fat can promote the increase in barrier permeability and bacterial translocation along with the decrease in TJ proteins and TER. On the contrary, diets, including probiotic bacterial species or prebiotic fibers, strengthen the epithelial barrier by increasing TJ proteins and TER and decreasing permeability and bacterial translocation, thus, preventing or ameliorating the inflammatory state. It remains to be determined by the link between nutrition and microbiota composition. This is a challenging task as the influence of factors, such as genetics, hygiene, and living conditions, are not taken into account in studies comparing distinct populations. In the recent years, the challenge for the human race was to obtain enough food to provide sufficient nutrients to the body. Nowadays, in vast regions of the planet, the challenge is to sustain the body with the right combination of nutrients able to prevent chronic inflammatory syndromes. We knew the importance of the intestinal permeability, we then realized the importance of the cross talk between the intestinal epithelium and the immune system, and we are just starting to realize the pivotal role of the microbiota for human health. A further level of complexity will need to be addressed in the near future; in particular, we will need to understand the cascade of events that lead to chronic inflammatory syndromes. This study shows that obesity rates in children seem to be stabilizing; however, children with lower socio-economic status are still at higher risk of obesity. Nutrition labelling can have a positive impact on people’s food choices. Simplifying it further, such as the “traffic light” labels may make this even more effective. Food labelling would increase the amount of people selecting a healthier food product by about 17.95% (confidence interval: +11.24% to +24.66%). • The capacity of skeletal muscle to regenerate declines with aging. • Skeletal muscle repair involves a cross-talk between immune and muscle cells. • The physiological activities of immune and muscle stem cells decline with aging. • Nutrients can act as controllers of immune and muscle cell function. • Nutrition may help in preserving the capacity for muscle to repair during aging. … nutrition has drawn much attention: studies have demonstrated that nutrients such as amino acids, n-3 polyunsaturated fatty acids, polyphenols and vitamin D can improve skeletal muscle regeneration by targeting key functions of immune cells, muscle cells or both. Compared with the controls, oats intake significantly reduced the concentrations of glycosylated hemoglobin A1c (HbA1c) (MD, −0.42%; 95% CI, −0.61% to −0.23%), fasting blood glucose (FBG) (MD, −0.39 mmol/L; 95% CI, −0.58 to −0.19 mmol/L), total cholesterol (TC) (MD, −0.49 mmol/L; 95% CI, −0.86 to −0.12 mmol/L), low-density lipoprotein cholesterol (LDL-C) (MD, −0.29 mmol/L; 95% CI, −0.48 to −0.09 mmol/L). Oatmeal significantly reduced the acute postprandial glucose and insulin responses compared with the control meal. The present study has revealed a beneficial effect of oats intake on glucose control and lipid profiles in type 2 diabetic patients. Further investigations of oats intake in patients with type 1 diabetes and the safety of oats consumption are required. Oats are classified as a kind of whole grain which is different from other grains. They are particularly high in soluble fiber, β-glucan and some micronutrients such as magnesium. The unique components and special physic-chemical properties largely decide the beneficial effects of oats. The beneficial effects of oats on glycemia and blood lipids are mainly related to oats β-glucan, a soluble and fermentable fiber, which cannot be decomposed and absorbed in the small intestine but can be fermented in the colon. The use of “subtherapeutic” antibiotics in agriculture is one contributor to antibiotic resistance, and the WHO hosted the first “World Antibiotic Awareness Week”. Antibiotics are commonly used to promote the growth of food-producing animals and to prevent, control and treat disease. Overuse on farms can lead to resistant bacteria that cause infections in both animals and humans and could spread resistance genes from animal bacteria to human pathogens. In November the World Health Organization hosted the first World Antibiotic Awareness Week to help people learn more about antibiotics on both the human and animal side and try to prompt governments to take action. Overall, favorable therapeutic effects in improving quality of life among cancer patients have been reported. Conflicting evidence exists for the effectiveness of CHM in prolonging survival and in reducing chemotherapy and/or radiotherapy related toxicities. No serious adverse effects were reported in all included studies. Evidence indicated that CHM could be considered as an option for improving quality of life among patients receiving palliative care. It is unclear if CHM may increase survival, or reduce therapy related toxicities. Here is an observational study that looked at urine levels of triclosan in pregnant women and compared ones’ who had a spontaneous abortion and those who did not. The results showed a much higher level of triclosan in the urine (11x higher) of women who had a spontaneous abortion. TCS is widely used in personal care products. Stanley et al. reported that the concentration of TCS that causes substantial inhibition of EST is in the range of the environmental exposure level14. The present study provides in vivo evidence that the exposure of human or mice to TCS, at least partially, through inhibiting EST activity might cause spontaneous abortion and growth retardation of fetuses. This study is the first to implicate that the activation of EST is required for the maintenance of pregnancy and fetal development during mid to late gestation in human. These findings suggest that mirrors have a special role for viewing the self. The results also support the importance of egocentric reference frames for body ownership and suggest that mirror reflections of one’s own body are related to peripersonal space, which enables updating of central body representations. Yes, a good intake of nutrients can help protect against negative effects of air pollution and particulate matter (PM)! It has been hypothesized that the intake of anti-oxidant and anti-inflammatory nutrients may ameliorate various respiratory and cardiovascular effects of air pollution through reductions in oxidative stress and inflammation. To date, several studies have suggested that some harmful effects of air pollution may be modified by intake of essential micronutrients (such as B vitamins, and vitamins C, D, and E) and long-chain polyunsaturated fatty acids. Here, we review the existing literature related to the potential for nutrition to modify the health impacts of air pollution, and offer a framework for examining these interactions. A prudent diet is a key determinant to health throughout the whole life and could reduce the deleterious impact of air pollution on health. As demonstrated, several studies showed that some nutrients such as B vitamins, vitamin C, vitamin E, vitamin D and omega-3 PUFA have protective effects against the damage induced by PM. In an air polluted environment, a healthy diet with adequate intake of essential micronutrients may be critical to prevent the development of chronic diseases, particularly cardiovascular and pulmonary diseases. Part 1 includes chapters for “How not to die from:” heart/lung/brain, etc. diseases with almost 3,000 scientific references; Part 2 has Dr. Greger’s favourite recipes, kitchen gadgets, brands, etc.. I’m looking forward to reading this! 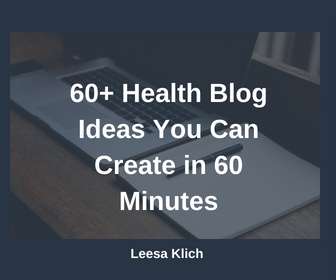 Leesa Klich lives at the intersection of science and holistic health (it’s really, really interesting here!) 🙂 At NutritionInteractions she helps holistic-minded people taking medications maximize the benefits of good nutrition. She also helps holistic health professionals find and understand science-based health information. She has a Master of Science degree in Toxicology and Nutrition and is currently studying to be a Registered Holistic Nutritionist. For a list of free health resources, click here. Holistic practitioners who want confidence that their recommendations have some science behind them. Do you want to learn how to quickly find relevant scientific evidence, and how to interpret it? Sign up here.